Blackberries are still in abundance, ripening and available at the farmer’s markets (as well as on bushes by the roadside, in parking lots and along sidewalks...I’m seeing them everywhere!). 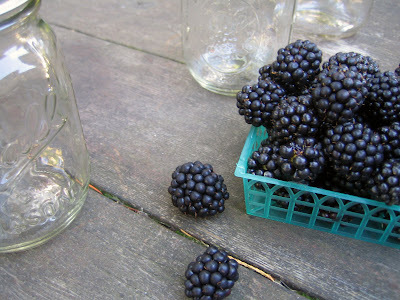 These blackberries call out to me and the desire to make something with them is strong. 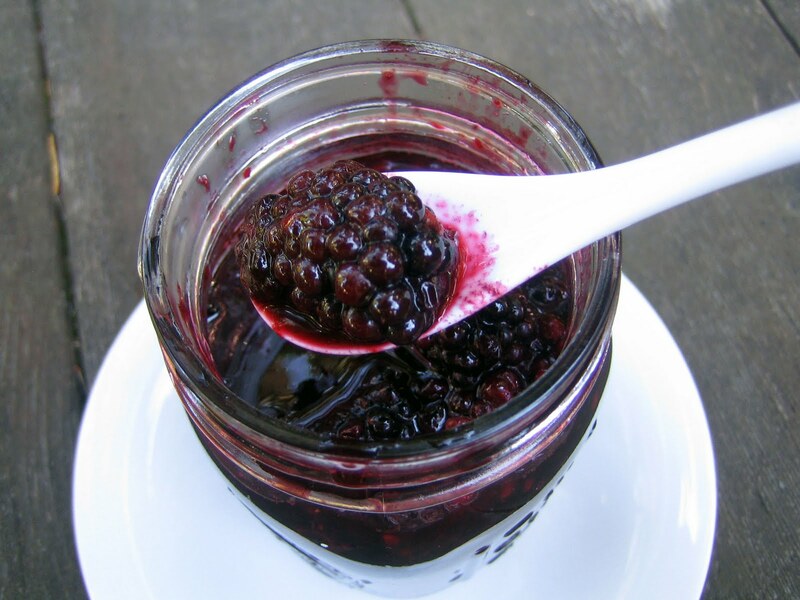 I recall seeing a recipe of Heidi Swanson’s (of 101 Cookbooks) for a blackberry compote sweetened with maple syrup. Anything involving maple syrup sticks in my memory. I think this must be due to my New England roots, plus its distinct sweetness adds such a depth of flavor to both sweet and savory dishes. I prefer to use Grade B syrup for its darker color and more concentrated taste. With a flat of blackberries and jug of maple syrup in hand, I head to the kitchen. These gorgeous berries are huge! I chop them roughly in half, just enough so that they blend into more of a sauce but retain some texture. A word of caution, when cutting them they will splatter juice everywhere! I hardly went crazy chopping, but ended up wiping drips and dribbles of juice off the counter, from the sides of the cabinets and up on shelves. A worthwhile endeavor, though! As the blackberries and maple syrup simmer together, my kitchen fills with a fabulous aroma. After stirring in some lemon zest and freshly grated ginger, I begin sampling. Is it tart? Is it sweet? Just one more taste...totally addictive. The compote is a delightful mix of summer and fall flavors. It is perfect to eat straight from the jar, stir into oatmeal, top pancakes or add to a cheese plate. I plan to serve it for dessert this week alongside homemade honey thyme ice cream. Enjoy some blackberry bliss! In a medium size sauce pan, bring 2 cups of the berries, the maple syrup and sugar to a simmer. Let cook for 10 minutes. Remove pan from the heat and stir in the remaining fresh berries, lemon zest, ginger and salt. Let cool. Ladle into jars or a sealed container. Spoon out as desired! It will keep in the fridge for a week. Blackberries are wild here, a weed really! But a delicious weed, so we'll keep them. I grabbed a handful as a snack the other day from a huge bush next to my car in the parking lot. Love it! I really prefer the grade B maple syrup, even though it's more difficult to find here. Grade A always seems so insipid! 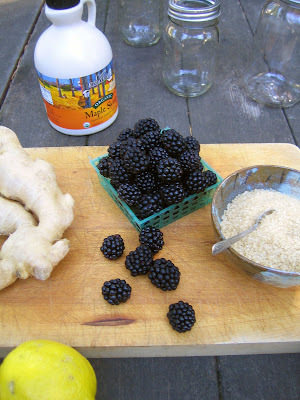 We are all out of blackberries on the East Coast. They were here for a fleeting moment. Love that compote! Looks great. Oh, what a good idea to mix these flavors. Blackberries are so gone here, though. Next summer! I agree with you...once I had Grade B I couldn't go back to Grade A. And Grade A is more expensive here, too! I shake my head in wonder when I see that. The compote is definitely versatile for breakfast or dessert. It was delicious on ice cream Friday night, and I just finished it off in my oatmeal this morning. Thank you, Lisa! It's a shame you had such a short blackberry season...hopefully it will be longer next summer. Thanks, Dani! I hope you can try the compote next summer! My parents in the UK still have blackberries, so they are going to try your recipe. I am thrilled to be part of your post, Lisa! Thank you for including me. And I'm so happy your parents will be trying the blackberry compote. I do hope they enjoy it.